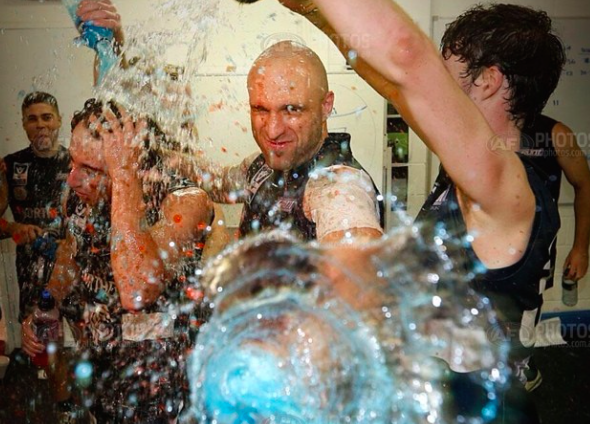 Thoughts of a Closet Recluse: The Chris Judd I knew. The Chris Judd I knew. It’s 6.30am on a Wednesday morning at then-VISY Park, back in 2012. I remember it being a Wednesday because it was my third day as a professional footballer. I remember it being half-six in the morning because it was my fourth day living in Melbourne, with little idea of time, distance, speed or Melbourne traffic city-bound on the Eastern Freeway. It was also daylight savings too. The VISY Park paddock only partially illuminated by the lights of our facility; all else was as dark as a funeral scarf. Arriving at this time at the club would soon become habit, but on this occasion as I put my bag in my locker amid a silent facility, I was acutely aware that I was probably the only one in at this stage. The rest of the players weren’t expected at the club until 8am, to ready ourselves for the main mid-week training session beginning at 10am. After a bit of pacing, the only light I saw in the whole place came from the rehab room. The human hubris of curiosity drew me to the room, and upon entering found Chris Judd on a Pilates reformer, receiving instructive guidance from Carlton Rehabilitation Coordinator, Mark Homewood. After the initial surprise of seeing the 18-year-old NSW Scholarship Holder rookie at the club before the sun had surfaced the Legends Stand, Chris invited me to join him. What ensued in the next hour and a bit is what I will remember Chris Judd for. Today’s press conference and announcement bore the scene more of a funeral and a man serving up his own obituary. The fishbowl-hysterical-passionate nature of the football world heightens the retirement to define that we have lost Chris Judd. Make no mistake. Chris Judd was and forever will be a champion footballer. The awards confirm what we already knew from the five-goal half against Brisbane, to the Norm Smith Medal performance in a losing Grand Final, to his two Brownlow years. But Chris would scold me in his laconic, laugh-out-loud kind of way if even for one second I thought his retirement to be some sort of “end”. As we lay on the Pilates reformers back in 2012, working our way through the exercises, Chris and I conversed. Being 18 and stupid (only my age has changed) all I wanted to talk about was football. Chris wanted to talk about everything else. Family, school, moving states, different sports, music, current affairs. He also gifted me a nickname that has stuck for the past four years, “Lodgenator”. The only slightly football-related topic we spoke of was the lesson that I took away from the whole conversation: you have your few hours a week of switching on, but remember what made you want to be where you are. Football – after all the layers of fireworks, hovercrafts, talkback radio shows, fans, opinions and finances are stripped away – is just a game. From there on, his aura evaporated and the Chris Judd I know is – yes, a good footballer, but more – a good person. I spent 12 months as a teammate-colleague of Chris Judd’s. The closest I got to pulling on the jumper with him was the team photo day. But the time spent off the track in the rehabilitation room or on the massage table – him for week-to-week preparation, me for the latest injury drama, both of us out of necessity – ensured that I came to know Chris in a light far away from those who simply lauded him for a hard ball get, or goal on the run. Chris is well read, approachable, always inquisitive and reserves judgement. Those four are great human qualities rarely found anywhere in this day and age, let alone in a footballer. When it came to football-related things, Chris was always able to communicate things to me in a simplistic, but intellectual way. I understood more when he spoke than when others (the coach) did. Chris, as a leader, emphasised the process more than the outcome. In team meetings, he would preach ‘standards’. There was little fanfare in the way he played the game. While he was explosive in speed, rarely was any form of celebration visible beyond that iconic squint, white mouthguard agape, sucking in all the air he could muster. The shying away from public attention was no more apparent than when Chris made his return to football mid-way through last year for the Northern Blues in the VFL. It would be Chris Judd’s VFL debut. Against Sandringham – a team he’d had small dealings with in his TAC Cup years with the Dragons. The Northern Blues squad and Chris trained the night before at VISY Park. For such a decorated player of Chris’ ilk training on a weekday night, with semi-professional footballers and homemade soup post-training, it was almost comical. Northern Blues coach Luke Webster introduced him as tomorrow’s VFL debutant, asked Chris to tell the group a little bit about himself, and then Chris trained. It was the mark of the man, who didn’t see himself to be above kicking the football with university undergraduate students, apprentice electricians and school teachers. I watched Chris train. After he finished he approached me and we chatted for 15 minutes like old friends. Me asking the slightly loaded questions of how his body was tracking, how was he feeling about Saturday. Him asking how university was going, how my own football was going, plans for holidays. Chris’ VFL debut drew almost 5,000 fans to VISY Park the following day. Journalists, camera crews, standoffish Carlton fans who didn’t know the Northern Blues even existed, rolled in. Chris wanted two things. To get through the game unscathed, and to win. Both things eventuated. And even though there was obvious and drug-like glee as 21 other teammates showered the 30-year-old in Powerade, as he sang the song arm-in-arm with current Northern Blues player, Jordan Perry, Chris wanted to be away from the circus of glowingly, admiring fans and prurient media. Chris was much more at ease when he was with the people who knew the processes he had to navigate through to make it to the next game, the next contest, the next day. Socially, he would laugh the loudest and the longest. An endearing quality for someone whose name often precedes his personality. His humour and his wit was dry and smart. Conversations sitting next to him at lunchtimes regularly had me and those around him in stitches. For the four years I’ve now known Chris, the mark, the landing, the facial expression of screwed-up agony was numbing to watch on Saturday. I’m sorry Chris, but this was an ‘end’. The sun rose the next morning and life went on, but the news kept playing the sickening incident over and over again as speculation grew about whether this was, in footballing verbatim, “the end”. As you delivered the words to bring the curtain down on your footballing career, I hope the Adelaide Crows’ supporters standing ovation, a show of unity that the fishbowl-hysterical-passionate nature of the football world is capable of, did not come as a surprise to you. You are a respected man, Chris. Footballer, you were great. Human being, you are and will continue to be great. Thank you for that time when I was 14 years old in the rooms, had just become a NSW Scholarship Holder at Carlton, and you went away from the training group, shook my hand and asked me my name. Thank you for that Wednesday morning Pilates session and the other sessions from then on. Thank you for introducing me to the TV Series, Game of Thrones. Thank you for the nickname. Sort of. Thank you for the quick advice when we were on the training track to help me understand. Thank you for the plethora of laughs. Thank you for the conversations, both light and deep, especially on the Hong Kong Footy Trip. And out of the almost 300 teammates you had at AFL level, thank you for making me feel worth my while from my first day at the club, to when we ran into each other late last week. Until we meet again, Chris. Thanks for the insight mate, it's great to get a feeling of the man behind the name. A fitting tribute and a great read. Great read n tribute from an avid WA Blues supporter!! Love your writing well said! Said this before but love your work big fella... exceptional read! Does this come with fish or tacos??? if so ill have the Tacos.